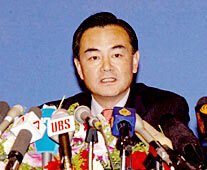 At a press conference held Aug. 29, 2003 following the six-party talks, Chinese Vice Foreign Minister Wang Yi says the six parties have reached six-point consensus on the Korean nuclear issue. 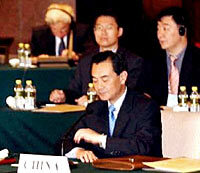 Chinese State Councilor Tang Jiaxuan meets six-party talks delegates in Beijing on August 29, 2003. Six-party talks are underway in Beijing.Wang Yi, Chinese vice Foreign MInister and head of Chinese delegation, is at the talks.